House of Commons Sergeant-at-Arms Kevin Vickers was lauded by members of Parliament Wednesday for his reported role in stopping an assailant who killed a Canadian Forces member in Ottawa. 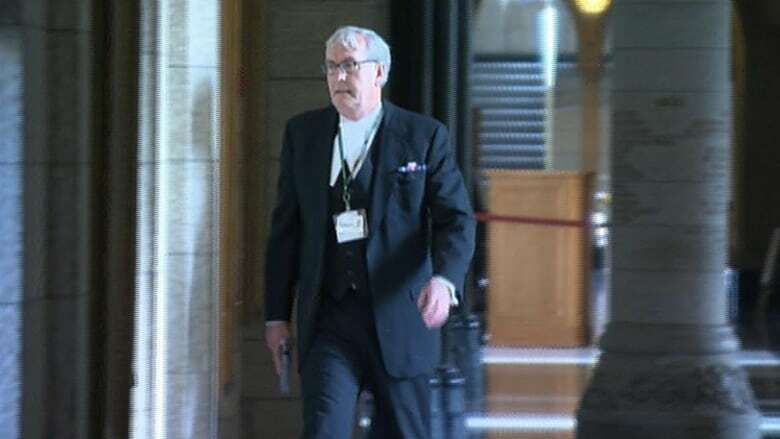 Vickers, 58, a native of Miramichi, N.B., was reportedly in the House of Commons when a gunman entered sometime after 9:52 a.m.
Officials have not confirmed that Vickers fired at the suspect, but multiple MPs credited Vickers on Twitter with helping to stop the attacker. "MPs and Hill staff owe their safety, even lives, to Sergeant at Arms Kevin Vickers who shot attacker just outside the MPs' caucus rooms." —New Democrat MP Craig Scott. "I am safe & profoundly grateful to Sgt at Arms Kevin Vickers & our security forces for selfless act of keeping us safe." —Veterans Affairs Minister Julian Fantino. "Thank God for Sgt at Arms Kevin Vickers & our Cdn security forces. True heroes." —Justice Minister Peter MacKay. "Kevin Vickers is such a fine man. His actions today are no surprise. Proud to call him a friend." —Green Party Leader Elizabeth May. Vickers became the sergeant-at-arms in the House of Commons eight years ago after a varied career in security that included protecting foreign dignitaries and members of the Royal Family. He spent 29 years with the RCMP and rose to the rank of chief superintendent, often serving as the face of the national police force in New Brunswick. Before his appointment as sergeant-of-arms, Vickers was director of security operations for the House of Commons. The sergeant-at-arms is responsible for safeguarding the authority of the House, as well as the safety and security of the Parliament Buildings. Vickers's brother John, who lives in Victoria, told CBC News Wednesday that his brother called their mother, Monica, at her New Brunswick home shortly after the incident to tell her he is safe. "I just couldn't be prouder of him right now," John said, adding that his brother has "always been committed to service, people and country." According to Keith, Vickers’s son is currently a police officer with the local force in Miramichi. “He’s the perfect man to be the sergeant-at-arms in Ottawa right now. I can assure you of that,” Bussières said. Prior to his appointment in the House of Commons, Vickers worked as an aide-de-camp for New Brunswick's former lieutenant-governor, Marilyn Trenholme Counsell. As an RCMP officer, Vickers was responsible for security services provided for the Queen and Prince Andrew. He is a recipient of the Queen's Jubilee medal, the Canada 125 medal and the RCMP Long Service medal. Former RCMP deputy commissioner Pierre-Yves Bourduas, who has also served as a security chief on Parliament Hill, called Vickers a "natural planner" and said his former RCMP colleague has always "had a contingency plan." "He actually did mock-up scenarios for the personnel ... very much like what happened today," Bourdas said. "Knowing Kevin the way I do, he is very troubled by this chain of events." Although sergeants-at-arms often operate outside of the public spotlight, the events on Parliament Hill are not the first time they have been instrumental in preventing bloodshed in Canadian history. When army supply clerk Denis Lortie opened fire in Quebec's National Assembly in 1984, the legislature's sergeant-at-arms went into the chamber and tried to calm him. Rene Jalbert, a retired major in the army, offered Lortie a cigarette and eventually persuaded him to release about a dozen hostages who were cowering in the chamber.